In light of recent events, it seems an appropriate time to revisit the plans, designs and history regarding the development progress at the site of the World Trade Center, where the 9/11 Memorial is slated to open this fall, followed by the Memorial Museum in 2012. 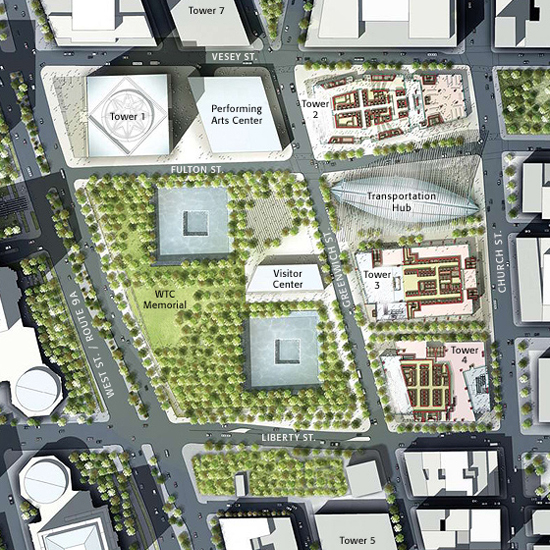 Two components of the overall master plan, the entire site will include a series of buildings, featuring the 1,776 feet tall 1 World Trade Center (formerly known as the ‘Freedom Tower’), as well as a transportation hub by Santiago Calatrava and new Performing Arts Center. Given the controversy and debate that has surrounded the project for years, this fall’s opening of the Memorial represents a significant step forward since the Lower Manhattan Development Corporation (LMDC) and the Port Authority selected architect Daniel Libeskind’s ‘Memory Foundations’ plan for the Freedom Tower almost ten years ago. With a revised plan approved by developers and stakeholders in 2006, the construction efforts have since accelerated and enabled significant progress at the site. The upcoming opening of the memorial, Reflecting Absence, represents not only one of the most historic moments in U.S. history, but an achievement in collaboration, communication, and community involvement, integral to this type of complex decision-making process. Designed by Michael Arad and Peter Walker, the memorial will serve as both a national landmark and a space for personal contemplation, reflection, and remembrance. The accompanying museum, by Davis Brody Bond, LLP, will feature interactive exhibits of personal stories of survivors and responders through displays, artifacts, and informational exhibits aimed to educate, enlighten, and inform visitors. An entry pavilion to the mainly subterranean space incorporates elements of the original structure as a tangible memory of what once was, further heightening this connection to place, history, and our collective consciousness. The design for Reflecting Absence was chosen from over 5,000 design entries, and the courtyard is the central element of the entire site. Encompassing an eight-acre portion of land, the memorial consists of hundreds of oak trees surrounding twin reflecting ponds at the towers' locations, with low walls inscribed with the names of victims of the 2001 and 1993 attacks. The physical and emotional voids created by the tragedy on 9-11 are symbolically represented by the thirty-foot deep pools encircled by the names of lives lost, creating a visual and emotional manifestation of this world-changing event. For construction images of the ongoing work at the World Trade Center site, as well as video links and animations, visit the WTC site created by developer Silverstein Properties, Inc.